Tracing Connections is for anyone who’s ever wondered how Systems Thinking can be effectively used to significantly and successfully transform education, business, public policy, and research. In ten chapters, teachers, World Bank Executives, corporate consultants, researchers and college professors lead the reader through an amazing spectrum of applied Systems Thinking that leads to unexpected realizations and critical understanding. Inspired by Barry Richmond, Systems Thinking pioneer, isee systems founder, and creator of STELLA and iThink, Tracing Connections reveals how a new way of thinking can radically improve your ability to work through complex issues and uncover elegant solutions. Tracing Connections: Voices of Systems Thinkers can be purchased at www.iseesystems.com. Lebanon, NH and Acton, MA, March 9, 2010 — isee systems, developer of Systems Thinking software STELLA® and iThink® and The Creative Learning Exchange, an organization that supports Systems Thinking in K-12 education, have partnered to publish Tracing Connections: Voices of Systems Thinkers. The book collects the experiences and thoughts of practitioners from education, business, public policy, and research to present its powerful applicability of Systems Thinking. 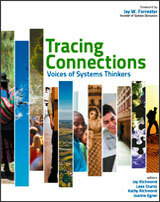 Proceeds from Tracing Connections will fund the Tracing Connections in Systems Thinking Scholarships that offer learning opportunities for educators to use Systems Thinking and System Dynamics in K-12 education. This year we will be offering some scholarships to help educators attend the ST/DM Conference organized by The Creative Learning Exchange. About isee systems (www.iseesystems.com) — isee systems is the world leader and innovator in Systems Thinking software. Founded in 1985, isee released STELLA®, the first software application to bring Systems Thinking to the desktop. In addition to STELLA, which is primarily used by educators, isee offers iThink® for business simulation. Thousands of individuals and organizations in over 80 countries use isee software to gain insight and shared understanding of environmental, financial, organizational, biological, chemical, mathematical, humanistic, and other systems. About The Creative Learning Exchange (www.clexchange.org) — The Creative Learning Exchange (CLE) was founded in 1991 as a non-profit organization to encourage the development of systems citizens who use Systems Thinking and System Dynamics to meet the interconnected challenges that face them at personal, community, and global levels. The CLE encourages an active, learner-centered process of discovery in K-12 education that engages students in meaningful, real-world problem solving through the mastery of Systems Thinking and System Dynamics modeling. The CLE website offers free curricular materials, newsletters, and documents that relate to systems education. The website also includes information about The Creative Learning Exchange’s biennial conference to help educators and students learn and utilize Systems Thinking and System Dynamics in their personal learning as well as in the classroom and the school organization.